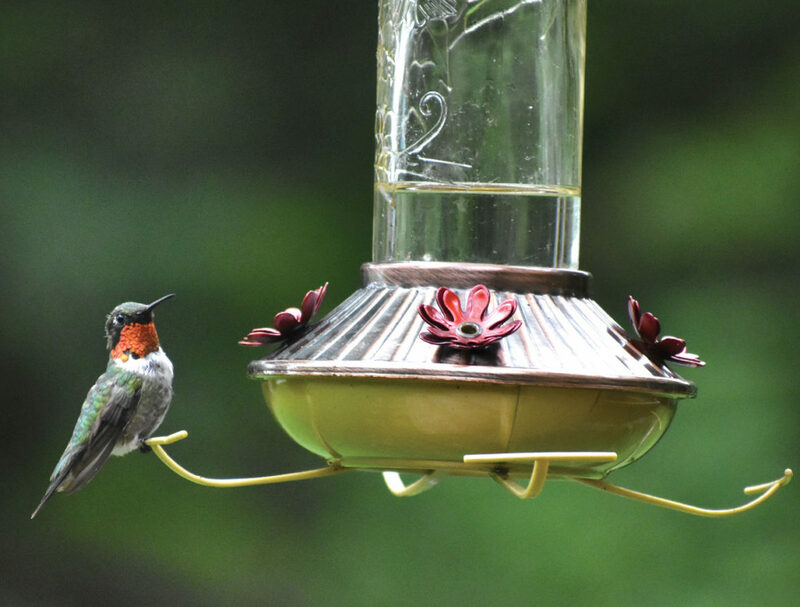 Multiple small feeders, spaced apart, may help ease disputes among hummingbirds. A ruby-throated male hummingbird rests during a feeding. Can hummingbirds be called a swarm? 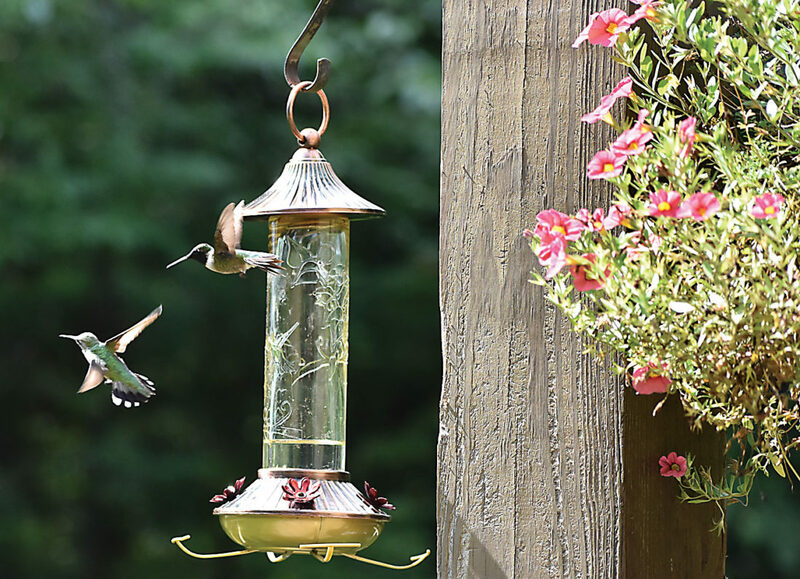 Several people in the area have reported the number of hummingbirds buzzing around their feeders has grown in the past couple weeks. We’ve seen the same out at Six Mile Lake, with groups of six to eight at a time jousting for a place at the feeder. Most of these likely are ones fledged in July. These young hummingbirds of the summer will resemble the more subdued green and white females, with even the young males lacking the vibrant red throat of an adult male. But at least a few of the flashy ruby-throated males remain in the area and still behave as if defending territory, chasing off others from the feeder. This seems to harken back to when hummingbird fiercely guarded nectar sources, lest they not have enough to fuel them for the coming migration, which can take them as far as Mexico and Central America, according to the Cornell Lab of Ornithology. The lab suggests placing multiple smaller feeders spaced apart, rather than one large, multi-port feeder or a cluster of feeders together, to reduce the feuds. The disputes might end soon, too, as the male hummingbirds are among the first migrating birds to head south, as early as the first weeks of August. Though the tiny size and hyper-speed metabolism would seem to indicate they’d burn out quickly, hummingbirds can be long-lived compared with some of the larger songbird species. One was at least 9 years old when she was recaptured during a banding operation in West Virginia, according to the Cornell Lab. One last note: Even when this wave appears to move out of the area, keep those feeders up. Stragglers can continue to move through well into autumn, and will find fewer food sources as the days become shorter and the local plants end blooming for the season. It’s also not true that keeping up the feeders encourages them to stick around — the urge to migrate should kick in no matter how good the conditions might be here. 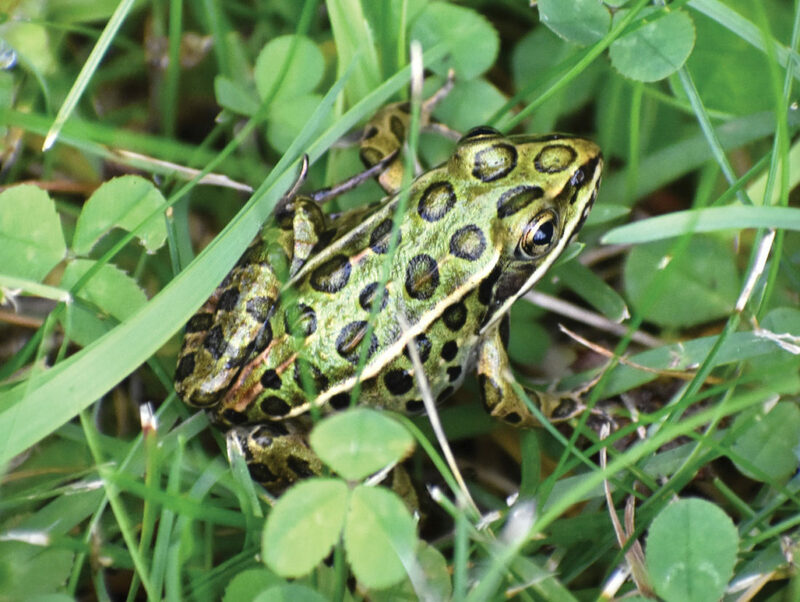 Friday morning found the yard at Six Mile Lake alive with little, hopping frogs, of a kind that has been scarce in recent years: the leopard frog. This column has mentioned in the past that researchers noted these once-common frogs had become spotty through parts of its past range, all but vanishing from some lakes and ponds. They had shown population fluctuations in the past, but this seemed a more serious decline. These small leopard frogs were the first I’ve seen this summer, and none showed themselves to me the previous year. So let’s hope this marks an upswing for this native amphibian. Betsy Bloom can be reached at 906-774-2772, ext. 40, or bbloom@ironmountaindailynews.com.